Once again Manna Design had a Trade Show Display at the Tri-County Economic Development Summit on the 28th of September, 2012. Each year, the Summit is Hosted by the Economic Development Departments of Burlington, Camden and Gloucester County, New Jersey. Several hundred of the region’s top business people gathered to hear updates on the economic state of the region. The Keynote Speaker was Joel Naroff, Ph.D. of Naroff Economic Advisors. Caren Franzini, Chief Executive Officer of the New Jersey Economic Development Authority (EDA) was honored with an award for her contributions to the Tri-County Region. The trade show portion had about 40 companies with displays. Among them were a few of Manna’s favorite website design clients: Stout & Caldwell Engineers, The County of Gloucester (GCIA), Business Committed to Burlington County and the Gloucester County Chamber of Commerce. The event overall was a great one to make new contacts and see old friends. As usual, it was very well run and a pleasure to attend. The economic development teams for each of the counties did a great job. 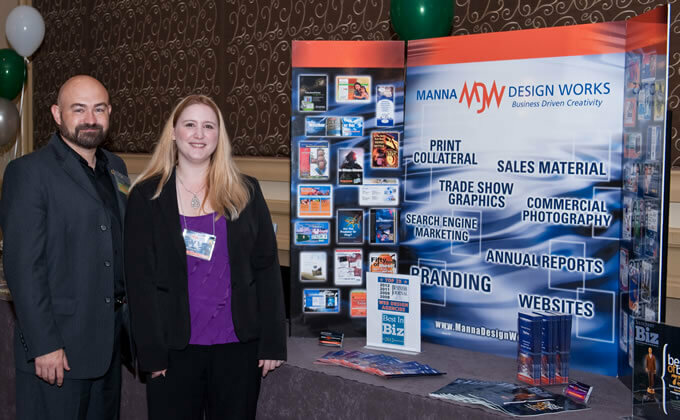 Robert Harrington and Alaina Onesti at Manna’s Trade Show Display at the Economic Development Summit.